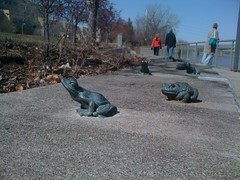 I looked for a walk, and found frogs. In this final week of yoga teacher-training, my fellow classmates and I are each filling out a lengthy take-home test, as well as preparing for what sounds like a low-pressure pop quiz in class, next weekend. Both will cover a wide array of topics, including anatomy, yogic philosophy, teaching and learning methods, and our retention of the specific asana series that we’ve been learning to teach. There is plenty of new vocabulary to assimilate, and I’m not just talking about such Sanskrit beauties as Isvara pranidhana or Svadisthana. Concentric contraction continues to confound me. But, assimilate it, I will, and I’m nearly there. An interesting thing is happening, on the way to the exam, however. I didn’t really think that learning some new vocabulary would make me start seeing things differently. That power seems to be reserved for inverted poses like headstand (enter instructor cue: “this when you get to see things, from another perspective”). This assumption – that my world had enough vocabulary in it – is pretty arrogant, but at some point in your life journey, you do need to start convincing yourself that you know enough to proceed. Isn’t that what courage is about? The interesting thing that is happening involves Chakras, and Camel pose (Ustrasana). I’d never been very fond of doing this pose, and for two reasons: 1) I rarely felt that I was actually doing the pose: I feel that I have a short back, and a rugby-abused neck. My spine just can’t bend backward very far, due to compression (I’d long been under the impression that the pose is more about lower back bend, than about chest opening ). And 2) I had never felt the catharsis that most yoga teachers claim it will trigger. I’d always expected some flaming ball of anger, steaming pile of remorse, or damp rag of gloom to present itself to me, and make me cry, upon rising out of this pose. It never happened. But, some time last week, it occurred to me that the emotional baggage is my distaste for the pose. Every time I do it, I spend the whole 30 seconds or 5-10 breaths, judging the short length of my spine, my inability to let my head drop, or the limited range of motion that I have in my shoulders. There’s always some degree of discomfort for me, in this pose, and it’s nearly impossible for me to get past that. So, when I rise out of the pose, I don’t ever suddenly feel like crying. But I usually feel very dissatisfied with it, and with myself. I feel empty; like I had wasted time. Why wouldn’t this feeling also fit into the “emotions will come up” bucket that teachers foretell so often? This wouldn’t be the first time that my emotional reaction is different than that of other people. I cry every time I listen to even three notes of Annie Lennox’s “Little Bird,” but it can take months or years for me to cry over the death of a friend. So, to tie in the Chakras: one of the concepts I’m working to understand and remember is the Chakras, and in particular, “Anahata,” the heart Chakra. The Chakra system is one metaphor that we can use for making sense of all the challenges and curve balls that life throws us. There are seven energy centers, or “Chakras,” in the body; they stack vertically from the tailbone up through the crown of the head. Each one is assigned a sort of governance over certain aspects of human life, ranging from stability, creativity, confidence, love, communication, humility, and solidarity (this resonates better than “unity with the divine,” for me). Various things that we do in our daily life (this can range from a simple misstep off a curb, to a hurtful conversation with someone) can cause congestion in one or more of those areas, and block the healthy flow of energy through and out of the body. The Anahata Chakra is located around the heart organ, spreading out through the chest and shoulders. The energy that flows through it (or not) has to do with love (big surprise), so things that might block the flow through the heart Chakra would be failure to feel compassion – for others, or for the self. So, if the Chakra metaphor is to provide me some enlightenment, regarding my experiences in Camel pose, I think it’s this, today: I need to be nicer to myself. I drove 3742 miles with Gabriel- SO MUCH FUN!! I hope the read was enjoyable. With some of these lecture topics, I’m forcing myself to write about them, here. It seems to be a good way to digest some concepts. Upon re-reading it, I am reminded of something I’ve actually known for years: you are one awesome gal! Despite my nearly intractable cynicism, after reading your words I find my self thinking again about things I’ve long since dismissed. Thank you for making my world a bigger and more interesting place. Jeremy! Thank you for the thoughtful re-reading and feedback. You should know that you have opened my eyes to rich things, as well. I hope we get to see you & your family, soon!